I was looking for somewhere to book for Sunday lunch with Steve and the kids after our recent trip to Kielder. I did consider the Anglers Arms but we've already visited there and I fancied somewhere new. 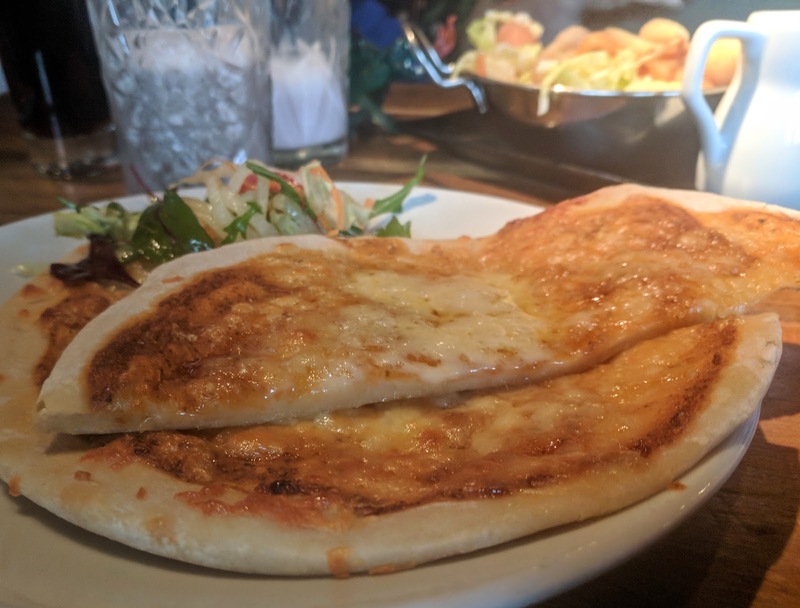 Battlesteads was another contender - especially as they were running a kids eat free offer but they stopped serving at 3pm which wasn't convenient for us. A quick look at google maps and I discovered that Otterburn was around halfway between our house and Kielder so I decided to focus our search there. 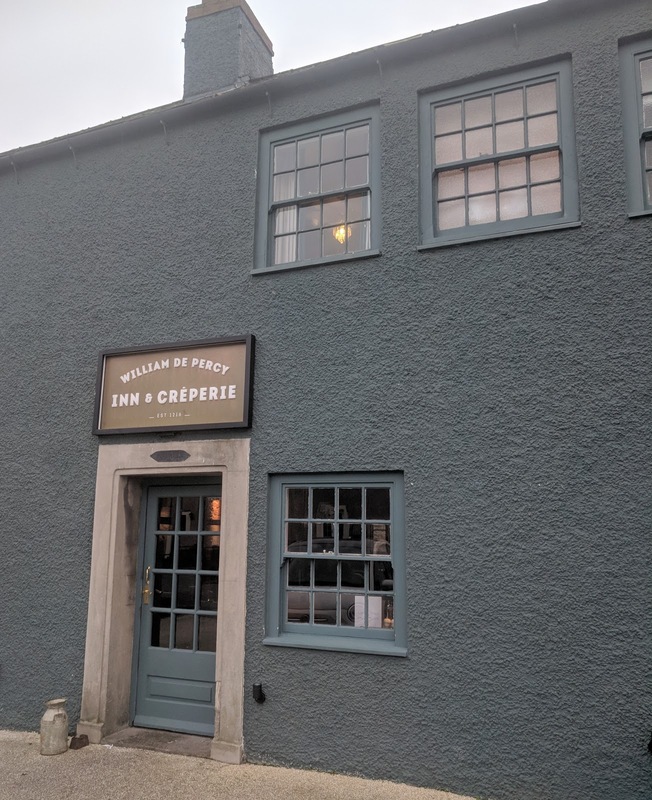 Another google, and William De Percy showed up as the best Sunday Lunch in the area (although this is by their own standards - they haven't won an award or anything). 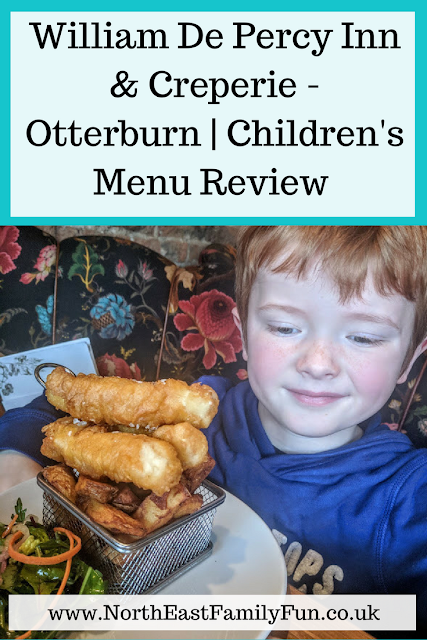 I could not find a Sunday lunch menu or children's menu for this establishment anywhere online which is always frustrating - I hate going in somewhere blind and not knowing whether it's going to be £20 for a main course or £7. Their TripAdvisor reviews were mixed too but we were running out of options so I crossed my fingers, booked a table and hoped for the best. Sunday lunches are priced at around £13 per main course as an FYI and Steve and I thoroughly enjoyed ours - Big Stevie Cool is writing a full review of our lunch and today I'm focusing on William De Percy's children's menu which was SO good and I'm really surprised the venue doesn't shout about this more. 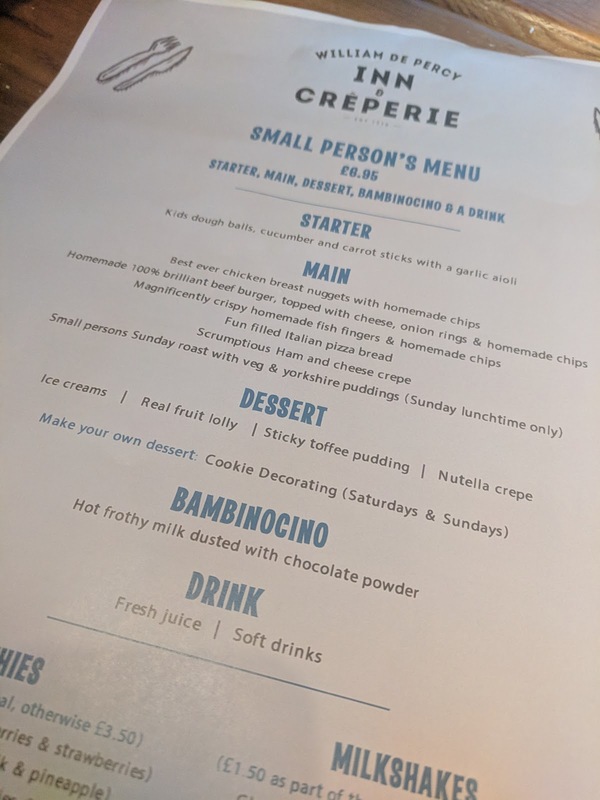 Kids can order three courses, a drink and bambinocino for just £6.95, everything is homemade, the portions are decent and there's plenty of choice too. Our total bill was just £65 which included 2 courses for Steve and I, 3 courses for the kids, 2 milkshakes, 2 cokes and a large glass of wine. Bargain! First of all, William De Percy is joined onto Le Petit Chateau which is a boutique hotel and wedding venue. A wedding was taking place during our visit and as the two establishments share a car park, getting parked was a little tricky. We ended up parking in a church car park up the road - not sure if this is allowed but heigh-ho. The pub is also dog-friendly and there were a fair few dogs in attendance. They were all well-behaved but if your little one has a fear, it's something to be mindful of. 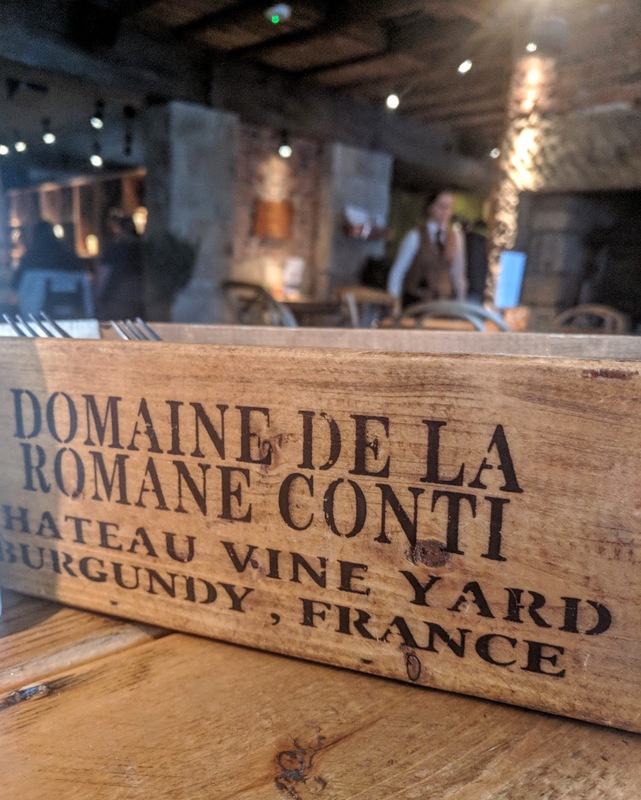 It's difficult to describe the interior - rustic, stripped back and shabby chic with a little bit of French flair comes to mind. I liked it - we were sat in a cosy booth and were very comfortable. There were plenty of families dining and I did not feel out of place bringing my kids here. 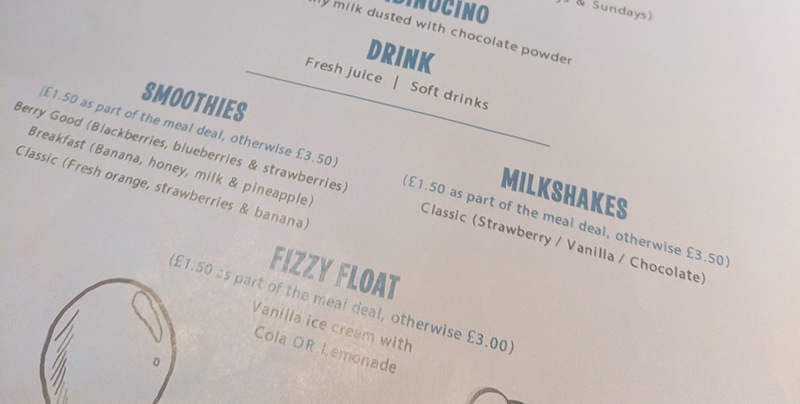 The children's menu really is a bargain and I love that pancakes are an option for both a main and dessert - this is a bit of a USP I think and I'm sure lots of children will order a double pancake feast. The menu is very well thought-out with kids in mind. 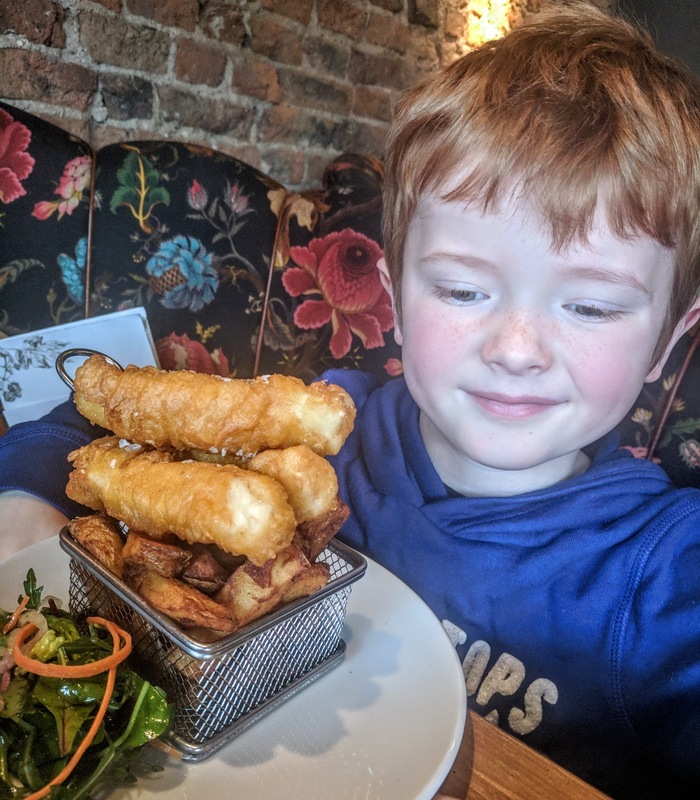 Harry for example was delighted to see his favourite dessert sticky toffee pudding on the menu and Jack was over the moon to see fish and chips featuring. 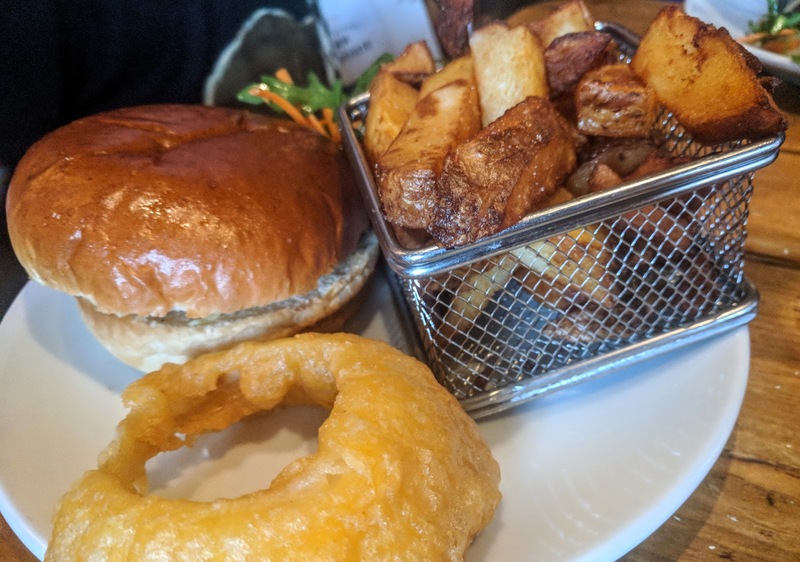 There aren't many healthy options - after your starter, Sunday Roast is the only chance to order fruit or veg (although meals are served with a side salad garnish) but this can be forgiven as a treat I think. 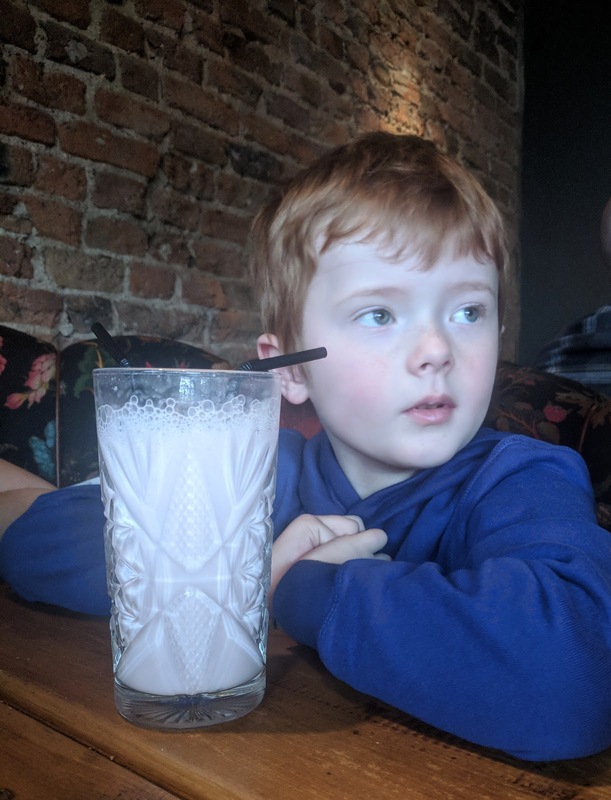 Heidi and Jack take after Steve and I and can't resist an upsell - they both ordered a milkshake with their meal for an additional £1.50 which was freshly made and a decent size too. 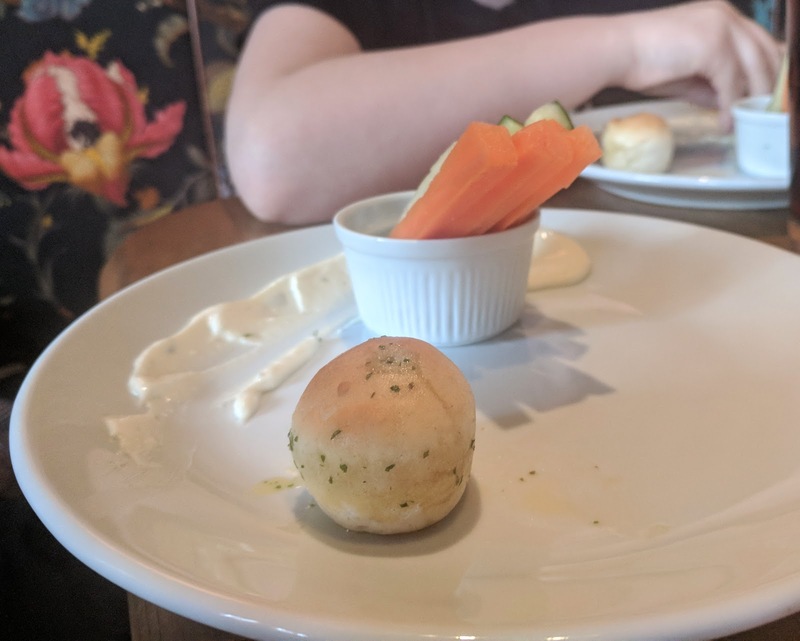 Starters for the kids are two dough balls (I would have liked to have seen 3/4 if I'm honest) plus carrot and cucumber sticks with a garlic mayo dip. All happily devoured by the three of them. Onto mains and I was super impressed with both the quality and the portion size of the children's meals. Jack ordered fish and chips and Harry went for the children's burger. Both were served with a decent portion of homemade chips and a dressed side salad and looked delicious. I find it hard to resist a homemade chip and stole a couple from Harry and have to say they were spot on. Heidi decided to go for the pizza and again, cleared her plate. 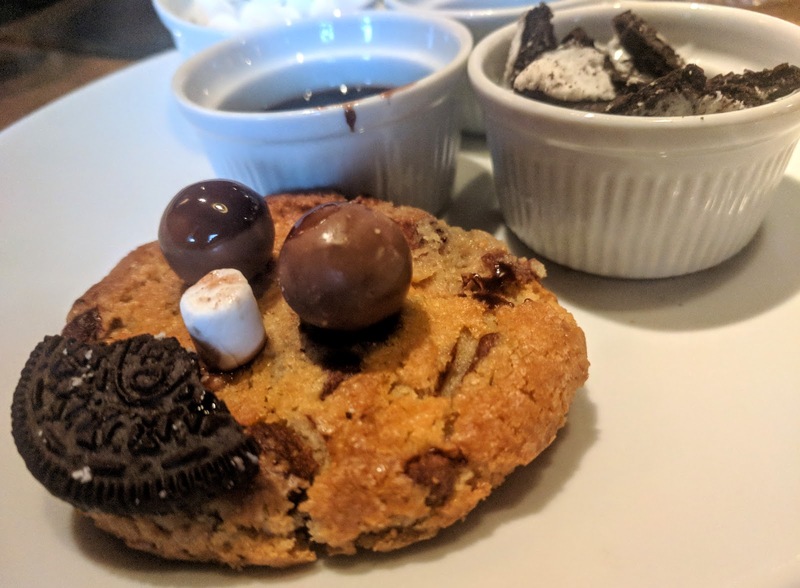 I really wanted one of the kids to order a Nutella pancake for dessert so I could get a pic but they weren't in the mood and went for decorate your own cookie, plain ice cream and sticky toffee pudding instead. Again, all delicious and dishes that I would have actually chosen myself. Steve and I ordered an after eight crepe to share for dessert and really think the kids were missing out not ordering a pancake - ours was divine! 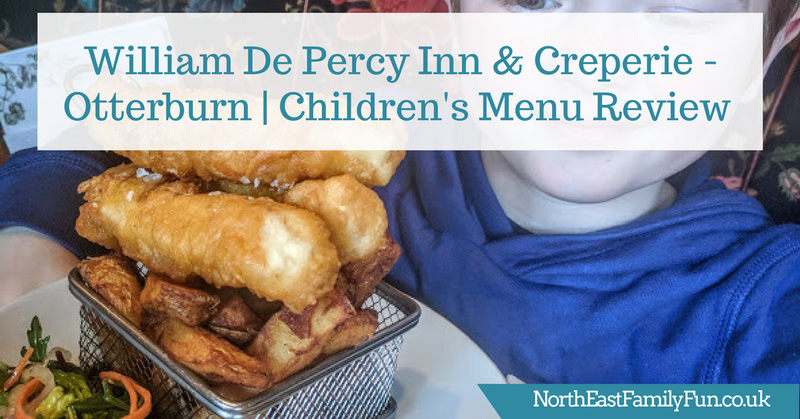 If you're looking for somewhere that serves lovely homemade food that will be appreciated by both kids and grown-ups, is child and dog-friendly, has a good atmosphere with attentive service in the heart of Northumberland, you'll love William De Percy in Otterburn. You can find out more and book online here. 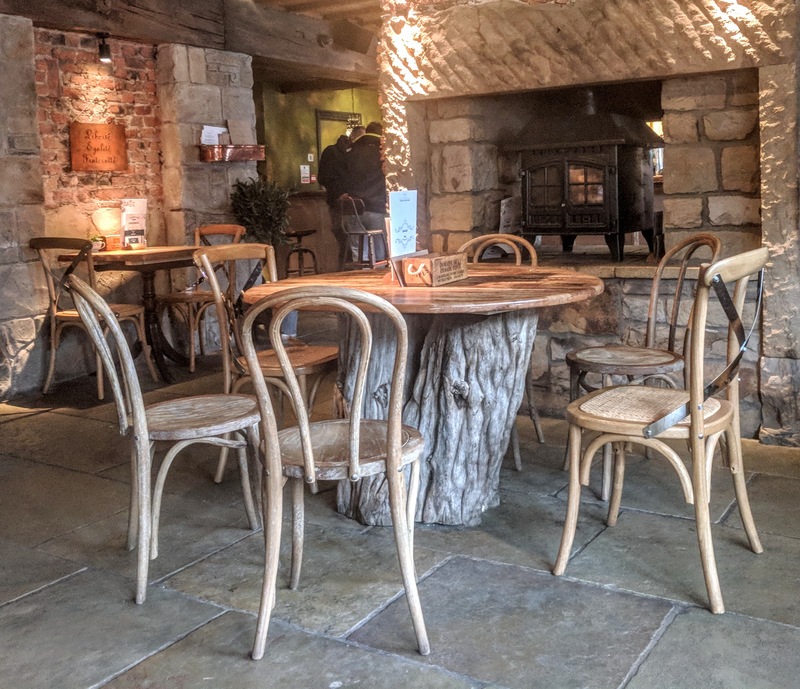 The William De Percy looks beautiful, love those tree trunk tables! Ha ha when people don't order the things you want to photograph .. story of my life! I honestly think you’ve had a bargain. I stayed there a few summers ago for a wedding and the breakfast was terrible and it put me off going again. However reading your review has changed my mind. I think Fenton might like a trip up! Katie x.